For as much as I love them, I make far too few muffins. When the urge to bake suddenly hit last week, I wanted to make something different, something I hadn’t made in awhile, and something that wouldn’t necessarily be a dessert either. 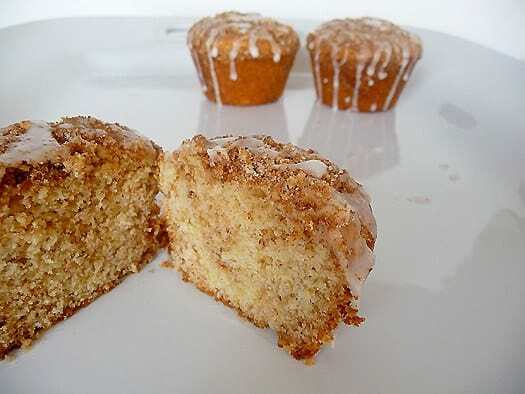 Muffins seemed like the perfect choice, and great ones can serve double duty as breakfast OR dessert, and these coffeecake muffins definitely fall into that category. 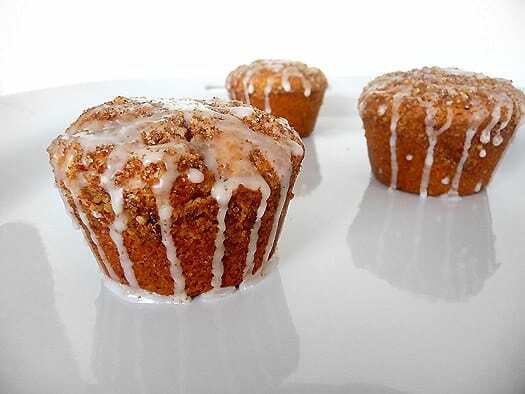 The pecan and dark brown sugar streusel is mixed into the batter as well as sprinkled on top of the muffins for a full blown sugary-spicy flavor that rivals the best of coffee cakes. Although you don’t necessarily have to include the glaze on top of these, it really would be a sin not to. The muffins are certainly fabulous on their own, but the glaze puts them over the top, especially if you want to keep the dessert option on the table (no pun intended!). The glaze soaks into the streusel on top leaving just enough sitting on top to look pretty, and runs down the side. These muffins would be perfect for a brunch or wedding or baby shower. 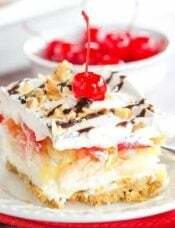 A food processor is used for this recipe because it can be used both to chop the nuts and mix the batter. If you don’t have a food processor, first chop the nuts with a knife. 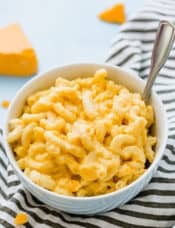 Proceed with the recipe, mixing the ingredients in a large bowl with a wooden spoon or spatula, then use a wire whisk to cream the butter-sugar mixture. 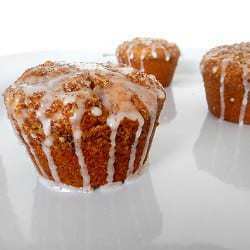 What are your favorite muffins? 1. Adjust an oven rack to the middle position and preheat the oven to 350°F. 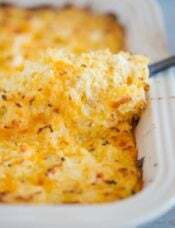 Grease a standard 12-cup muffin tin and set aside. 2. In the bowl of a food processor fitted with the metal blade, process the nuts, brown sugar, and cinnamon until the nuts are the size of sesame seeds, about ten 1-second pulses. Use a rubber spatula to scrape down the sides and bottom of the food processor bowl and transfer the mixture to a medium bowl and set aside. 3. Return the bowl and metal blade to the food processor, add the flour, granulated sugar, and salt and process until combined, about five 1-second pulses. Sprinkle the butter evenly over the flour mixture and process until the butter is the size of oats, about eight 1-second pulses. Remove ½ cup of the flour-butter mixture and stir it with a fork into the reserved brown sugar mixture until combined to make the streusel. 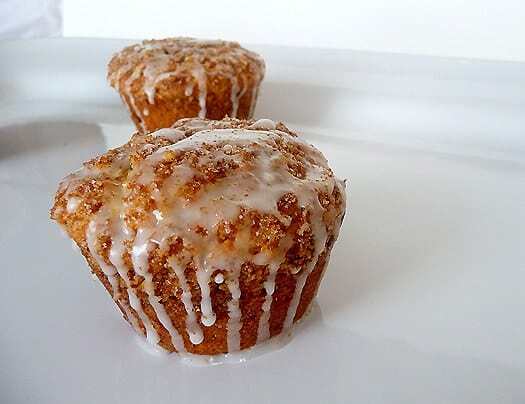 Set aside ¾ cup of the streusel for the muffin batter and the remaining portion for topping the muffins. 4. Add the baking powder and baking soda to the remaining flour mixture in the food processor bowl and process until combined, about five 1-second pulses. 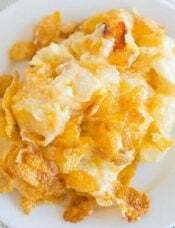 Whisk together the sour cream, egg, and vanilla in a 1-cup glass measuring cup and add to the flour mixture. 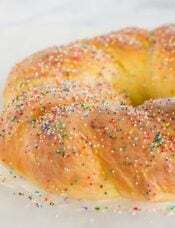 Process until the batter is just moistened, about five 1-second pulses. Add the remaining ¾ cup of the streusel to the flour mixture and process until the streusel is just distributed throughout the batter and the batter looks crumbly, about five 1-second pulses. 5. Using a large spoon sprayed with nonstick cooking spray to prevent sticking, divide the batter among 12 muffin cups. 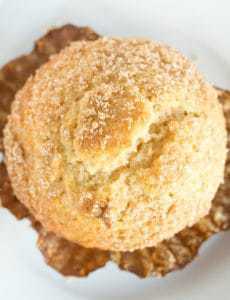 Sprinkle with a scant tablespoon of streusel on top of each muffin, pressing lightly so that the streusel sinks slightly into the batter. 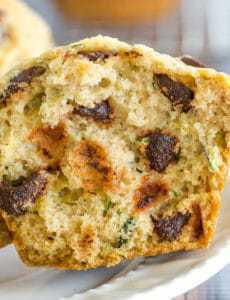 Bake the muffins until a toothpick inserted in the center of a muffin comes out with several crumbs clinging to it, about 18 minutes, rotating the pan from front to back halfway through the baking time. Avoid overbaking. Place the muffin tin on a wire rack and allow the muffins to cool in the tin for 2 minutes. Using the tip of a paring knife, loosen the muffins and gently transfer them from the tin to the wire rack. Cool for 5 minutes. Serve warm. 6. If glazing the muffins, place a sheet of parchment paper beneath the wire rack as the muffins cool. 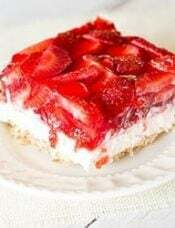 Whisk the confectioner's sugar and water in a medium bowl until smooth. Spoon about 2 teaspoons glaze over each muffin, letting the glaze run down the sides of the muffins. Serve warm. I made this recipe and my wife and I really liked it, but when you copy word for word shouldn’t you cite your reference? These were honestly the best muffins I have ever made and I’ve made a lot. I made them with without a food processor and I baked them a couple minutes more than the eighteen minutes specified. The flavor was incredible, they were so moist and they looked appetizing as well. Thanks for posting! I made these today, and only had 1/4 c of sour cream and 1/4 c half & half, so I used that along with 1/4 milk. They still tasted soooo good! Love your recipes! Thank you brown eyed baker! I have a hard time finding unsalted butter. Would this recipe work if I used salted butter and omited the salt in the recipe? Hi Sarah, Yes, you could do that. 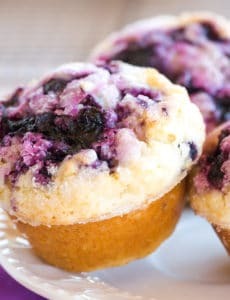 I found your site by accident and made these muffins Memorial Day morning for the family. Major major hit in my house! I didn’t have a food processor so everything was mixed by hand…which took FOREVER. Highly recommend using the whizzer like the recipe states.